Prices are per person and include tuition, lodging, all meals (sample menu), and boat transportation to the Light Station from our mainland base. An additional 9% Maine state lodging tax will be charged on the meals and lodging portion of the fee. Registration: sign up with the online registration form. If you are unable to sign up online, please find the printable PDF form here. 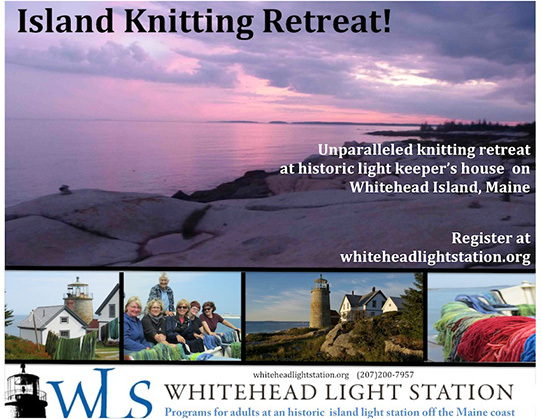 Join fellow knitters for a relaxing island knitting retreat. Enjoy early September on the island when the sunrise isn't quite so early and the sunset isn't quite so late. You will have plenty of time to both relax and finish up those knitting projects. As is true for all of our programs, this unique learning experience is enriched by the unparalleled beauty of Whitehead Island. Guests stay in the historic and elegant Light Keeper's House and are treated to delicious meals prepared with ingredients from Maine's mid-coast area. There's a chair waiting for you. Register now. "At Whitehead Light Station, we seek to give participants an unparalleled opportunity to enjoy the dramatic coast of Maine in an atmosphere that will broaden knowledge, strengthen skills, and promote renewal. We aim to achieve these goals through a program of simple living, appreciation of the natural world, and first-rate instruction."